Please help us to grow by linking to us. You do not need prior permission. We are more than happy for you to link 'freely' to any page on this website from your site or blog. Please use one of these reference styles below and insert the correct details. This is only necessary if you want to provide a reference for your information source. You can also use the style recommended by your institution. Author Name: In most cases (especially if there is no other listed author) the content is always created by Steve Spruce. Published Date: This is the date that the author first placed the information online (for new content). In most cases, you can find it at the bottom of each page. It may be an estimated date for recently added information on the site. Retrieved Date: Use today's date (or the date you first accessed the article if it was not today). Article Title: The title of each web page is in the tab above the browser window. Webpage URL: The website Internet address of each page begins with [https://]. That means it is a verified and secure connection. Please click here to Contact Us if you need any help with citations or linking to The UK Rules website. Example banner 300px x 350px you can use (contact us for more sizes). In most cases you will need permission to reproduce any section of this site. Please contact us if you need to request copyright permission to use parts of this site. 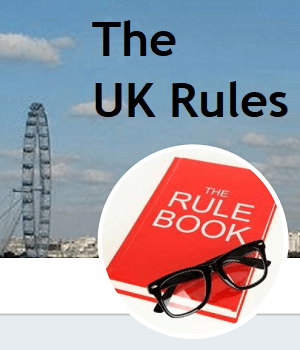 Note: You can link freely to The UK Rules website without getting permission. This copyright notice applies to all images and text on the pages of this site (www.theukrules.co.uk). But, it does not apply to any content labelled as created and copyrighted to another person. Note: The purpose of copyright is to protect work and stop others from using it without the owner's permission. Thus, understanding how copyright protects your work can help avoid cases of infringement. Note: On most pages of this site there is no author information listed. In these cases the content is most likely created by our team or it got commissioned by The UK Rules. Read how our terms and conditions may apply.